1. 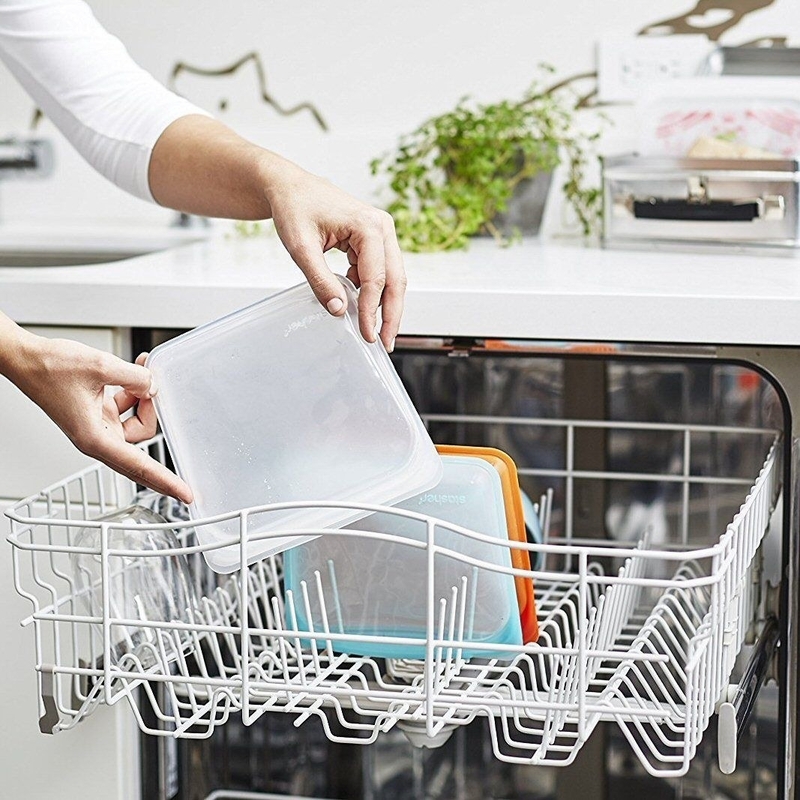 A caddy to keep your sponges and brushes in a nice, organized place — you know, 'cause sinks are FILTHY places! Don't leave your sponges at the bottom of the sink, people! 2. An over-the-door organizer that can hold a variety of things like cleaners, sandwich bags, and cooking sprays. 3. And for the other door, a shopping bag holder because we're all adults here and it's time to stop shoving them in the back of your cabinets. 4. A gorgeous glass pitcher — and I don't know about you, but I am r-e-a-d-y for summertime AND ALL THE LEMONADE. 5. And! A set of mason jar drinking glasses so your lemonade looks *extra* refreshing on a hot day. Plus, the plastic straws are included! 6. A non-stick Dutch oven perfect for all your one pot recipes. More yummy food and less dishes needs to be our 2019 mantra. 7. A three-piece bamboo cutting board set that'll look amazing on your countertops, or when you serve cheese, or shoot — even as you're chopping veggies. 8. A coffee pod organizer for all those tea, sugar packets, K-cups, and creamers you have tossed around in random drawers. 9. A collapsible colander with a handle that can conveniently break down into a smaller unit so it takes up significantly less cabinet space! 10. A wrap organizer for giving the tower of sandwich baggies and aluminum foil under the sink some order so you can grab what you need without everything toppling over. 11. A handy rack that'll prop up pot and pan lids and declutter your cabinets once and for all. 12. A beverage dispenser to organize a cluttered fridge and give you quick access to your favorite soda. Let us no longer fight with cardboard packaging and drop carbonated drinks on the ground. 13. A set of ramekins in pretty prints and colors you can bake *and* serve in. Little cakes, snacks, dips...I can go on! 14. A bamboo wine rack because having vino in an easy-to-reach place is grownup rule number one. 15. A corner rack so you can fully optimize every inch of cabinet space — which we all know is very important real estate! 16. An air-purifying, deodorizing bag to keep your fridge from smelling like something died in it. I mean, we all forget about leftovers from time to time (ok fine, me all the time). 17. A boil-over safeguard so you can step away from your stove and not worry about coming back to a volcano of steaming water bubbles. 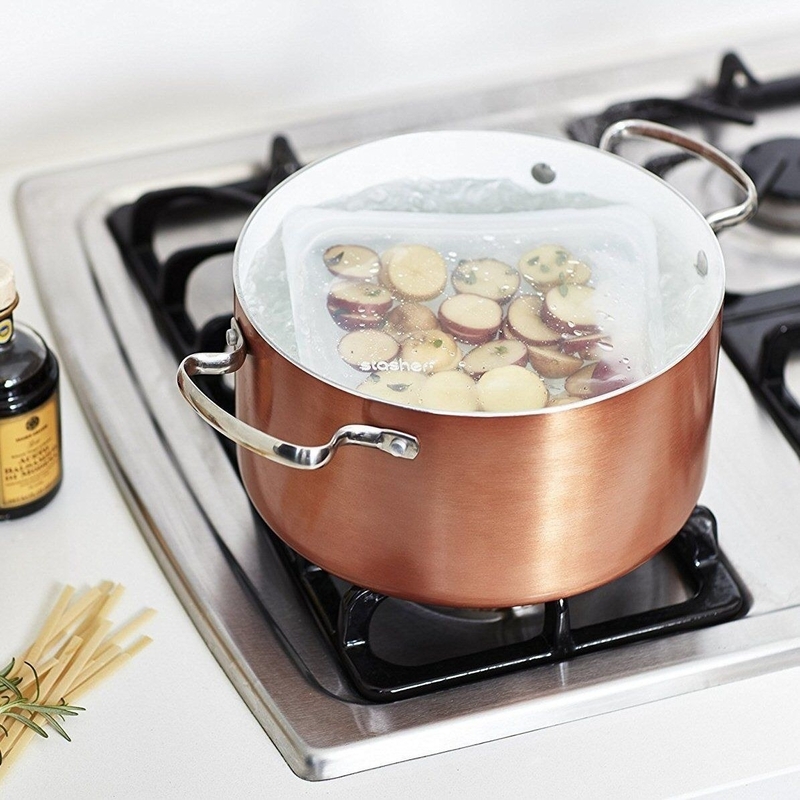 This handy thing is heat-resistant up to 500ºF, and is microwave a top-rack dishwasher safe. 18. Taco holders to keep all the good stuff from falling out, because baby, your tacos are worth it. 19. An herb stripper with different sized slots for quickly shearing all kinds of leafy greens. Think: kale, rosemary, parsley, and so on. 20. A baggy rack that can clip to bags and prop them up so you can get all your leftovers safely inside without the fuss of spills. 21. A dishwasher magnet you can switch back and forth to indicate if the dishes are clean or dirty. Now you won't have to wonder if you're eating off a dirty plate! 22. A rotating food server with a pretty floral print that's reason enough to throw all the summer dinner parties. 23. Reusable silicone bags you can use to store all your produce, snacks, and leftovers — or even as a marinating or sous vide bag. Yay for reducing plastic use, spending less money on eating out, and yummy foods! They're dishwasher, freezer, oven, and microwave safe! 24. A can rack that'll completely change how you store your favorite soups and cokes. Slip it in your most-cluttered cabinet or in the fridge and maximize 👏 that 👏 space 👏! 25. A pineapple corer so you can cut and slice in total ease — which is very important considering you're going to be eating sweet pineapple under the sun all summer long. 26. A pair of claw shredders you'll want to get your ~paws~ on ASAP for all of your meat carving and pulling needs. 27. A magnetic strip that'll free up some crucial drawer space and give you more room for other utensils. 28. 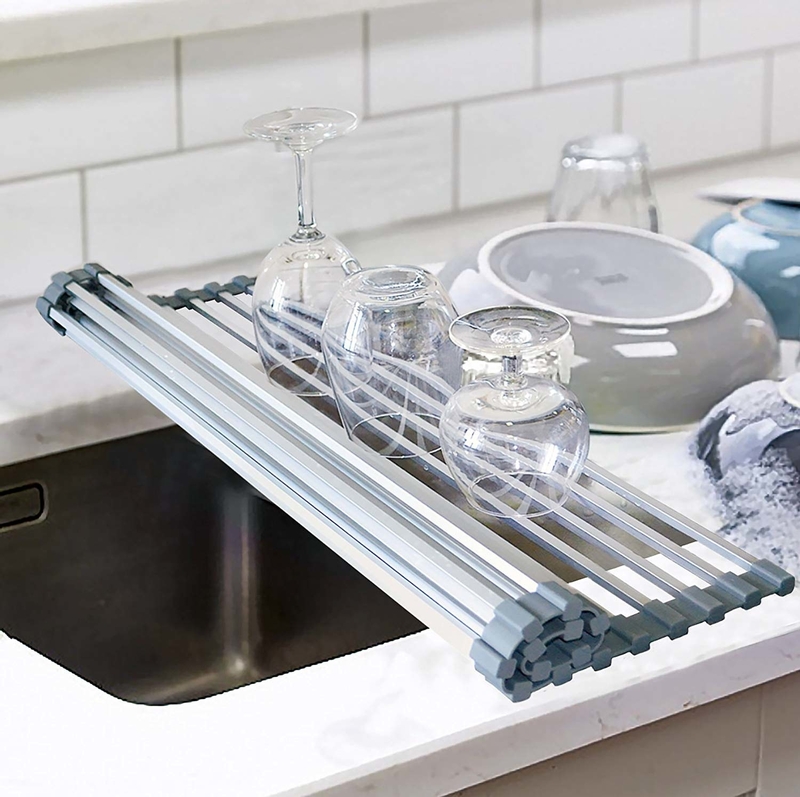 A roll-up drying rack you and your (dry) countertops will be thrilled to have around. 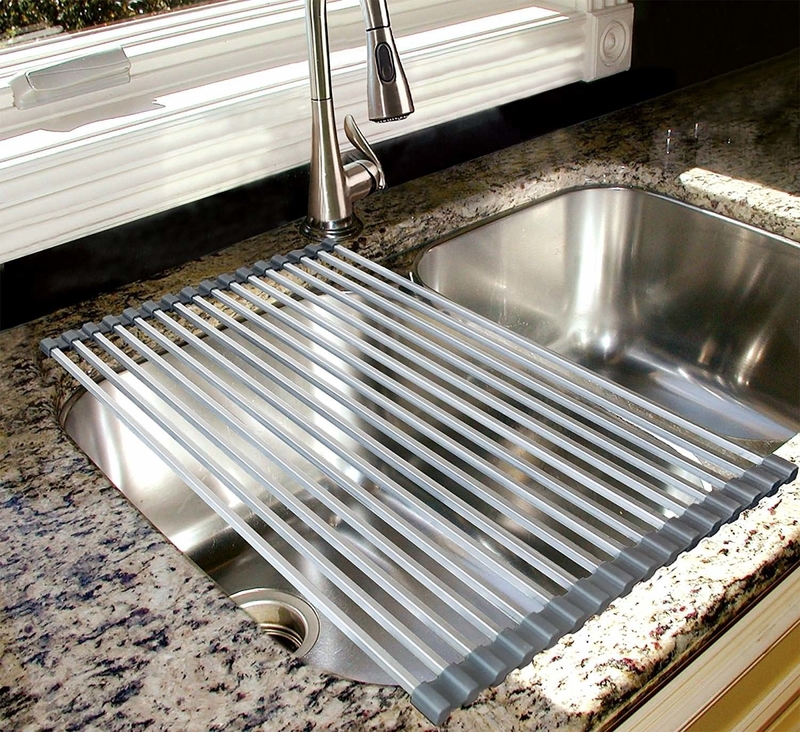 And for those with minimal cooking space, this can be used for washing veggies! 30. A six-piece knife set with wooden handles because we ALL need more reasons to eat MORE cheese. 32. And a set of three stackable cooling racks that won't take up all your counter space while your cookies (or say...homemade fried chicken!!!) come to the perfect temperature.